D.E. Gemmill Inc. is a leading provider of pavement marking and maintenance products and services. Based in York, PA, we serve a range of different markets and strive to deliver an exceptional experience for everyone we work with. 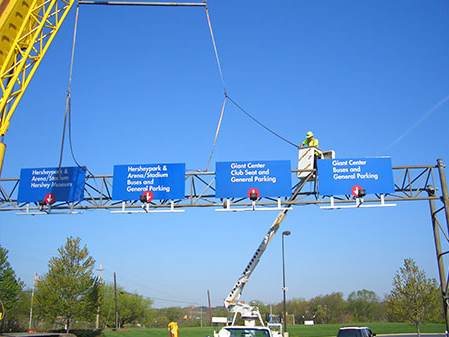 Our core services include parking lot and highway painting, seal coating and crack sealing, traffic sign and bollard installation, retroreflectivity management and more. In addition to our contracting work, we also supply high-visibility clothing and traffic control products through our retail store. Keep reading to learn more about who we are and what we do — or get in touch to speak with a representative directly. David E. Gemmill founded D.E. Gemmill Inc. in 1986 and continues to serve as the company’s president. Our journey started with pavement markings and maintenance for asphalt services. Our many years of service to our assorted markets we cater to give us the capability to offer our customers exceptional experience and grow our focus and geographical reach accordingly. Today, we are a prominent contractor for all of Pennsylvania as well as parts of Maryland, Delaware, and Virginia. Sensing a need for improved access to quality products, our company recently moved into safety equipment and signage sales, with a focus on serving construction crews, public works departments, warehousing operations, fire and EMS departments and more. Our SOS mobile storefront complements our online and retail operations. In everything we do, our goal is to be an innovative, reliable and quality-conscious leader. We are quick to embrace new technologies and to incorporate feedback to serve our customers better. We believe that making safety a priority leads to mutual success for both our organization and our clients. As a leading Pennsylvania pavement marking and road line painting company, we aim to provide great service, accurate estimates and on-time delivery of complex projects. As a retailer, our goal is to offer a carefully curated selection of products that meet ANSI and other critical safety standards. Explore our website to learn more about how D.E. Gemmill Inc. can help you achieve your organizational goals and keep your employees safe on the job in Pennsylvania, Delaware, Virginia, and the tri-state area. For assistance with sales or to request a consultation about any of our services, contact us today. In everything we do, our goal is to be an innovative, reliable and quality-conscious leader.